Hello all! 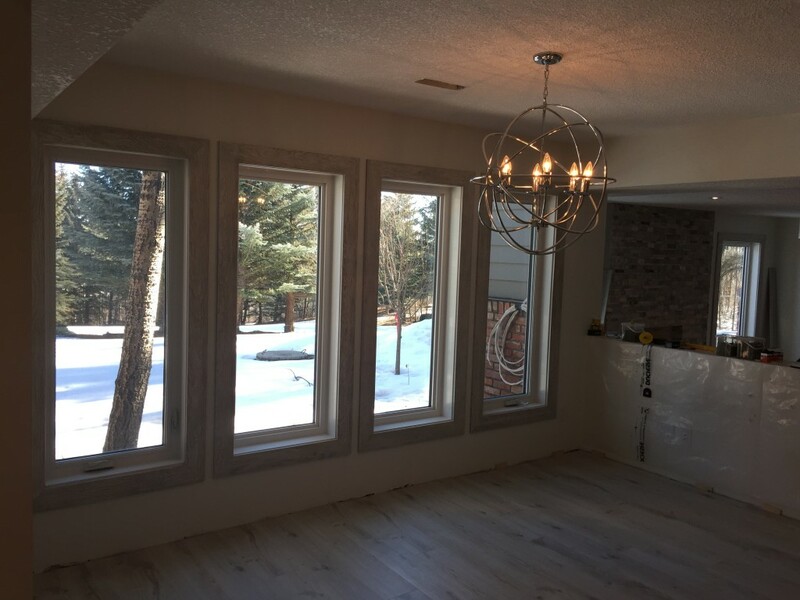 Things are coming along at the acreage….here’s an update on our progress! 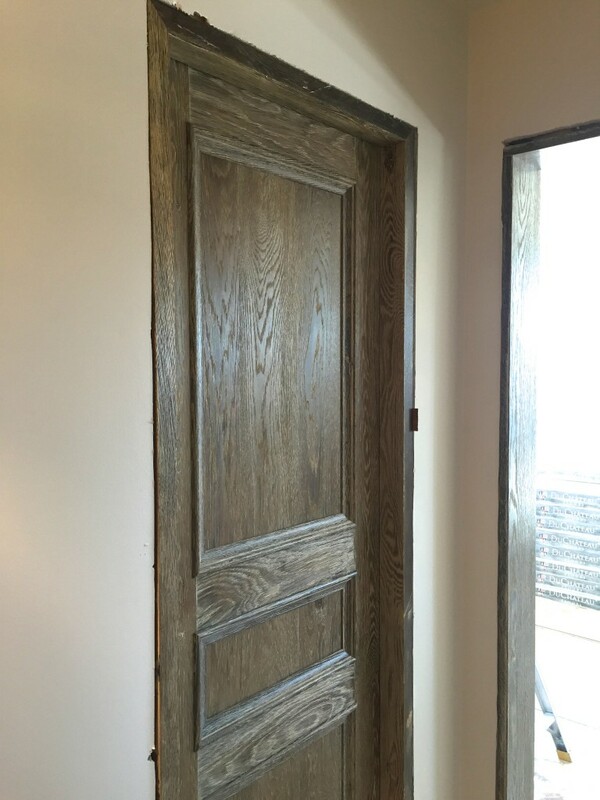 First door hung! Just the casing along the perimeter needs to be added on. 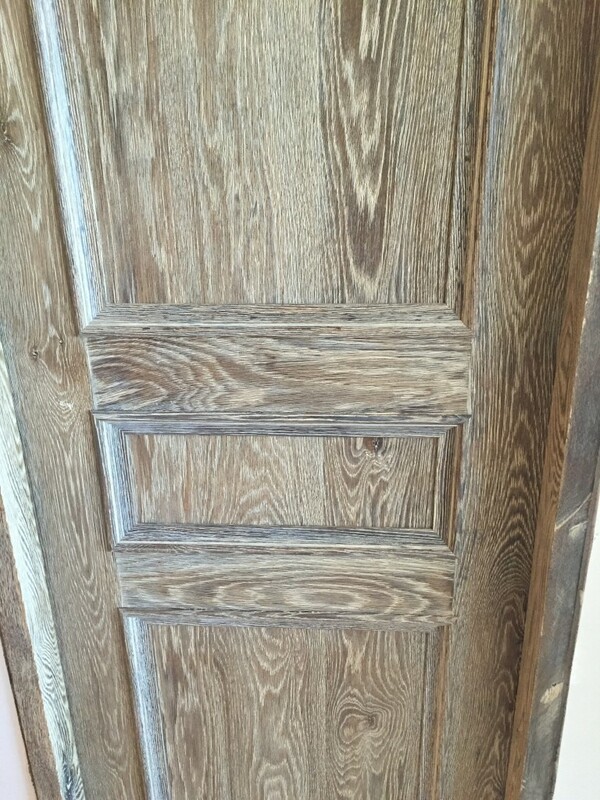 Look at that wood detail! 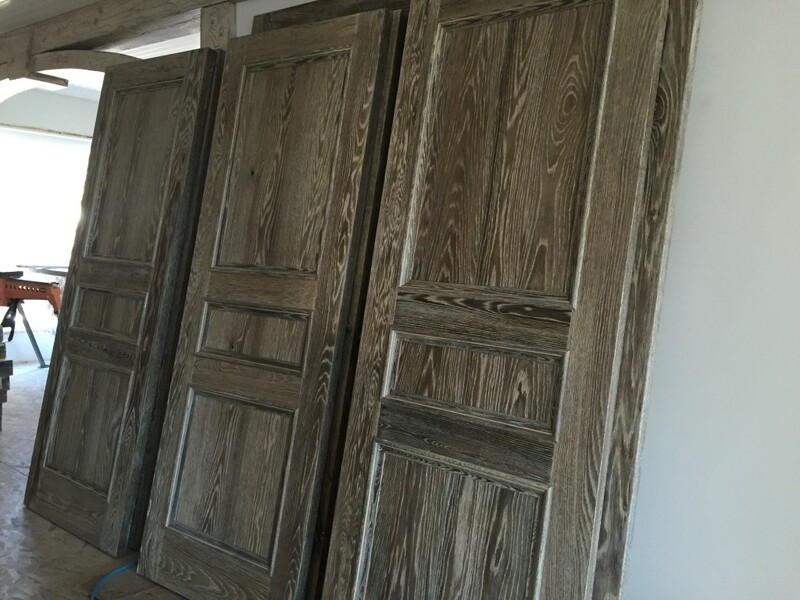 Doors for the upper floor. 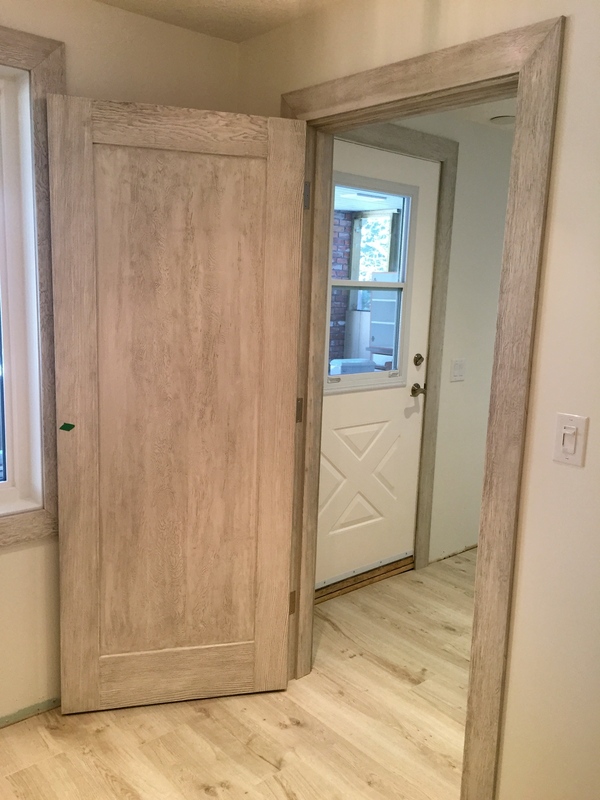 That’s a piece of drywall sitting in front of the barn door….should have moved it for the photo, but this is the finished barn door from the hallway to the sunroom. 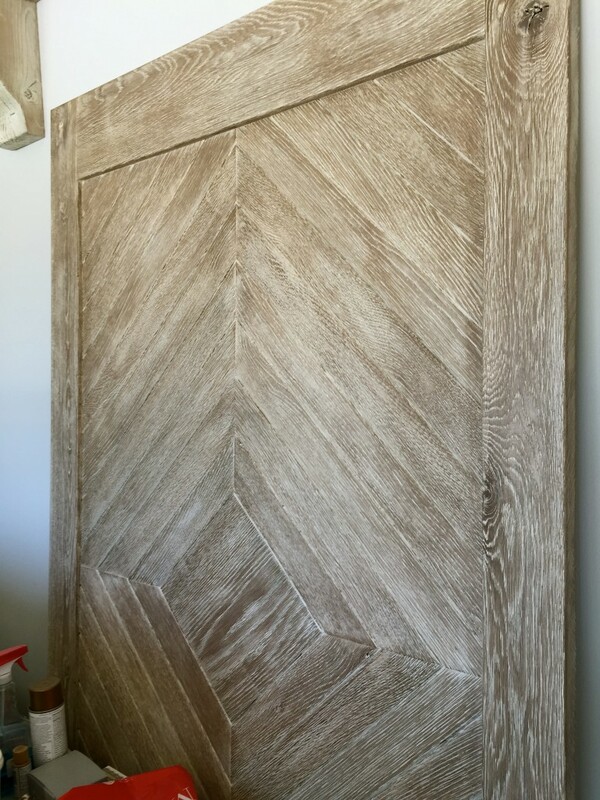 Designed and made as a special surprise for us from Rick, he knew how much I wanted to bring some chevron into the house and went ahead and produced this stunning door. How nice is that? 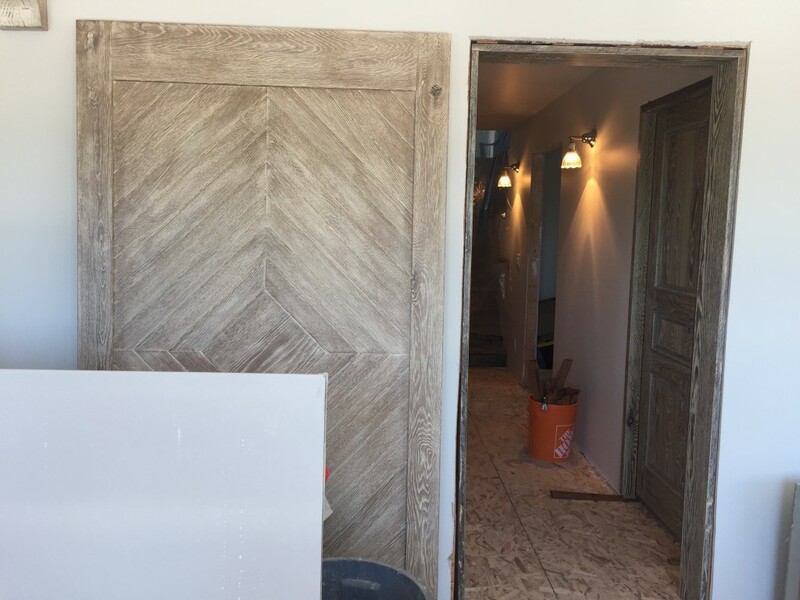 He’s now making a matching mini dutch door for the mudroom. 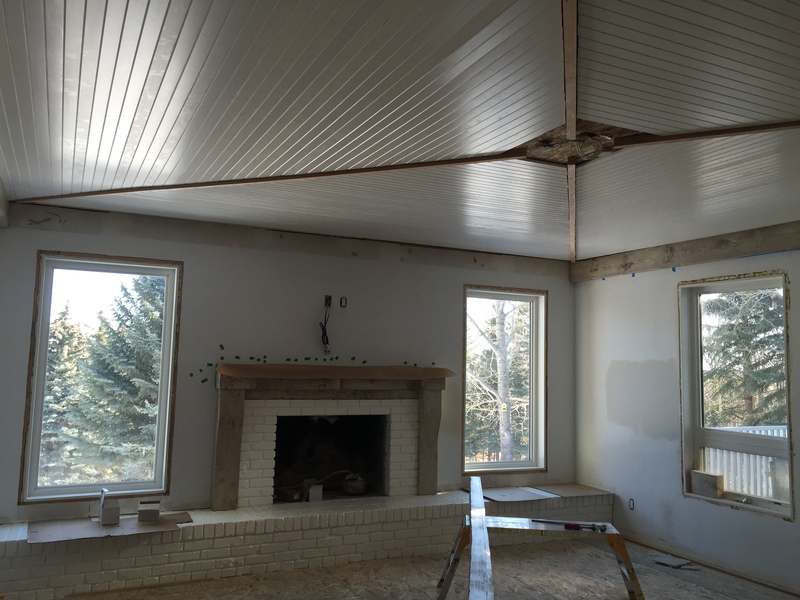 Ceiling work in the family room almost completed. 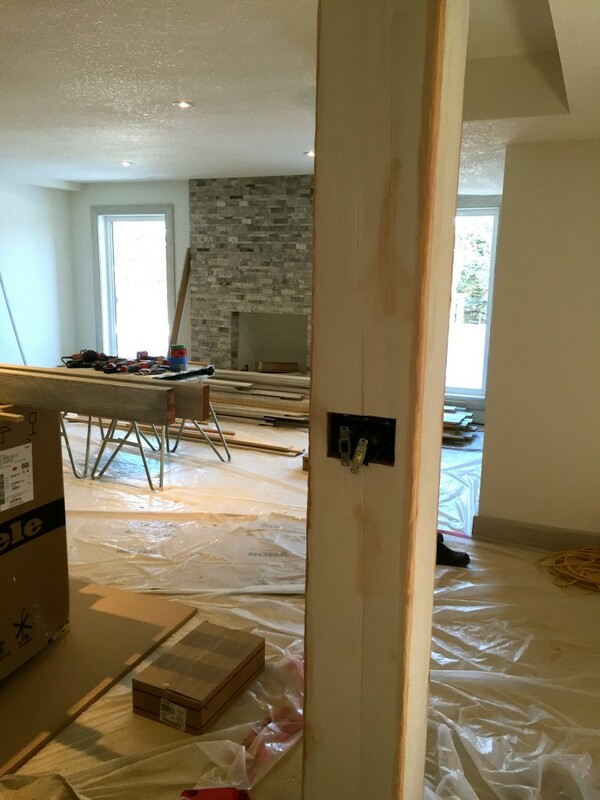 There is a white trim that will cap the braces (shown in raw wood) going towards the middle. 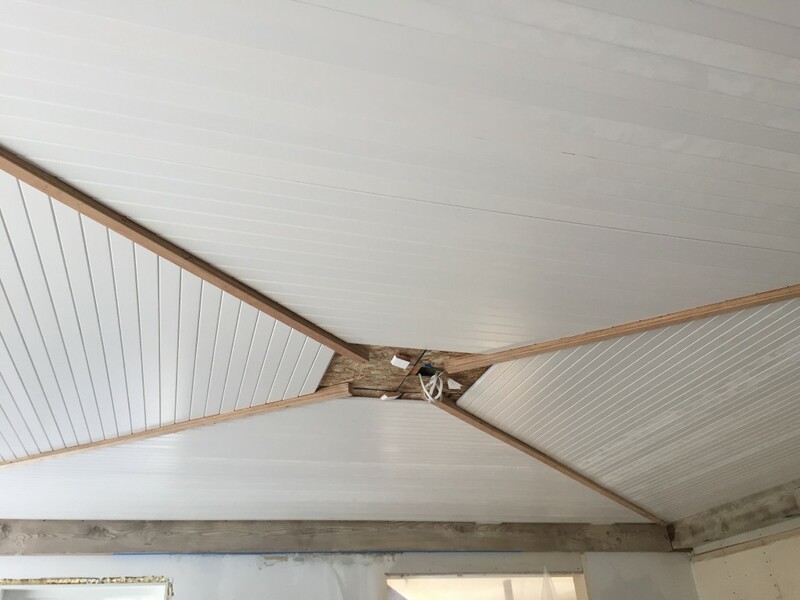 A square diamond shaped cap will be applied to the centre and then we have a ceiling fan to be mounted on top of it. These babies are outer corner pieces for the family room ceiling (there’s a fourth one not shown). 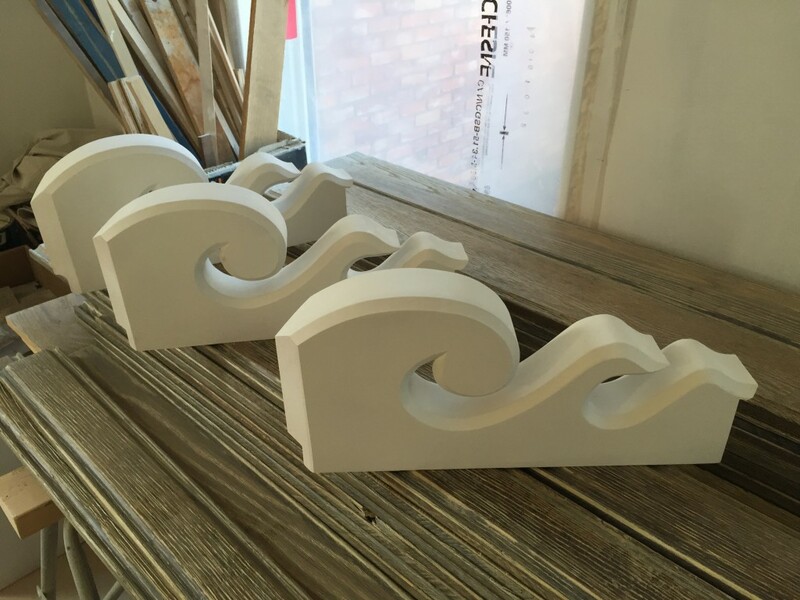 They remind me of waves of water…. Fireplace has been painted in a semi-gloss white. Window trims yet to be installed. 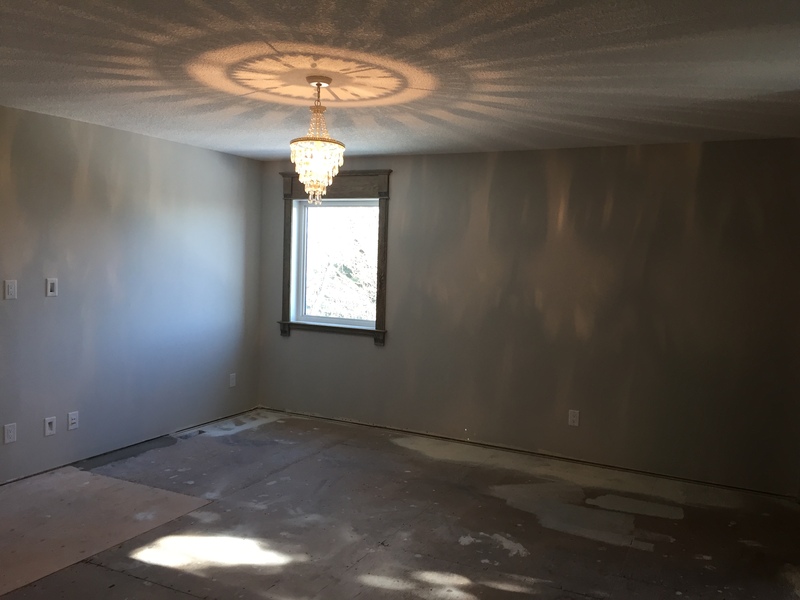 This room will be our primary family space. I made some wonderful large carpet pillows to flank the hearth! View from the family room into the kitchen area. A long counter with cabinetry will stretch across under the kitchen window with a farm sink in the middle. I’ve always dreamed of an old fashioned farm sink! So excited! 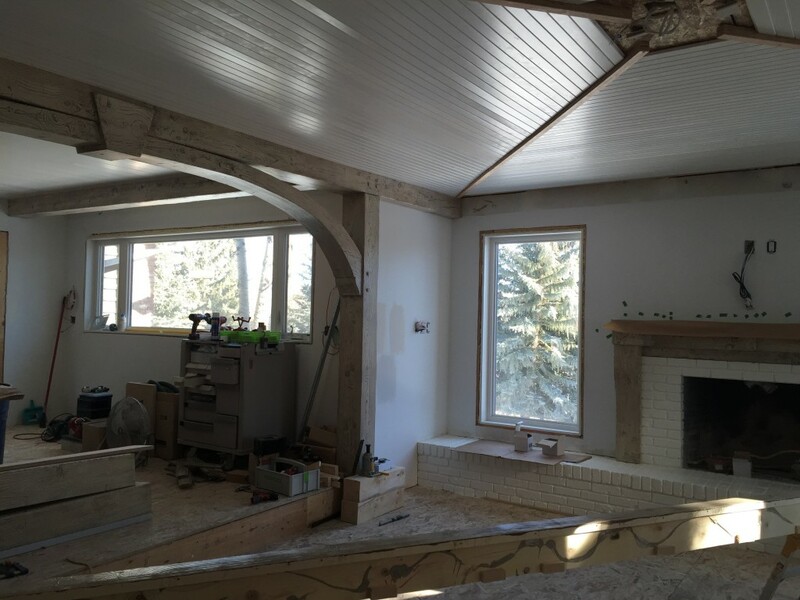 There will be a live edge eating bar coming part way across the opening (on the left side) open into the family room with a couple of stools. Down into the basement here. The metal support columns are now boxed in and awaiting the paint finish. 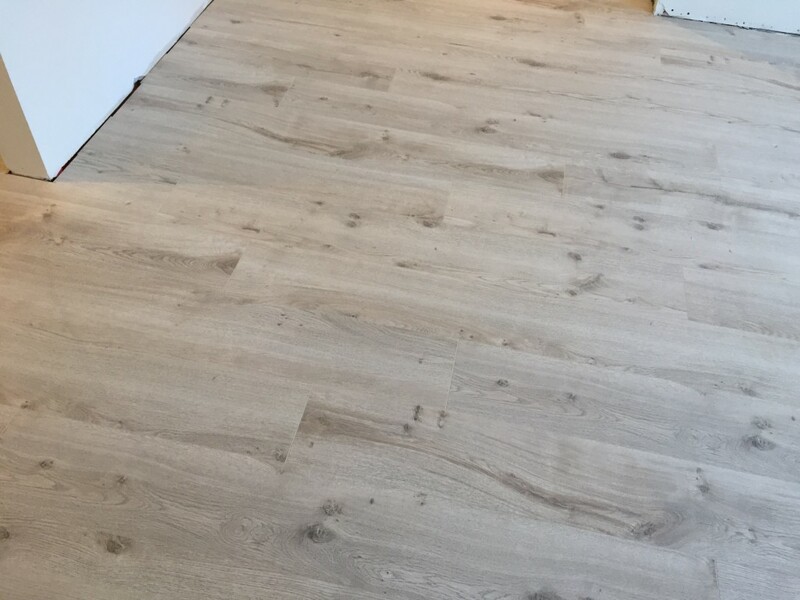 Basement laminate flooring looking good! 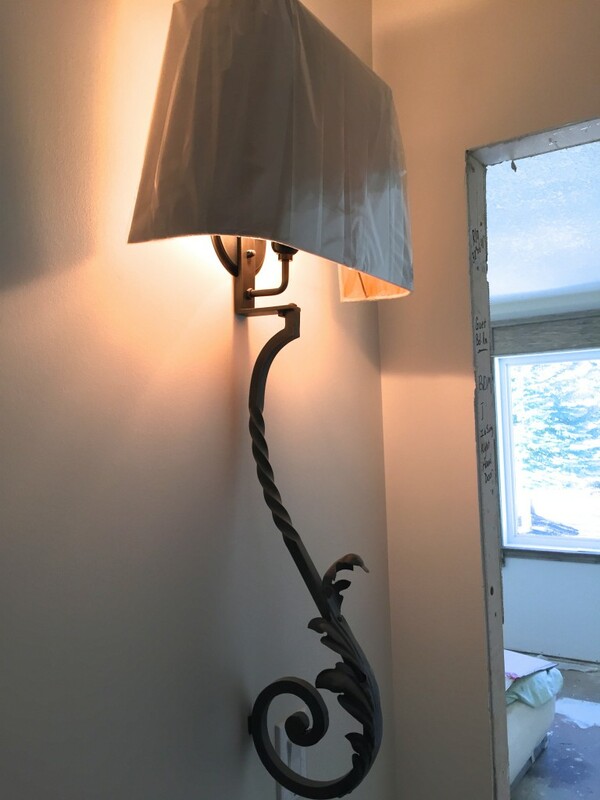 I opted for a subtle modern look down here…some metallics such as the chrome light fixture picks up some sparkle. I want to use chrome in the kitchen adjacent to the dining area as well. Dining area for the kitchen suite. I love the view…there’s often squirrels running about just outside the window. Floor picks up some soft greys and taupes. 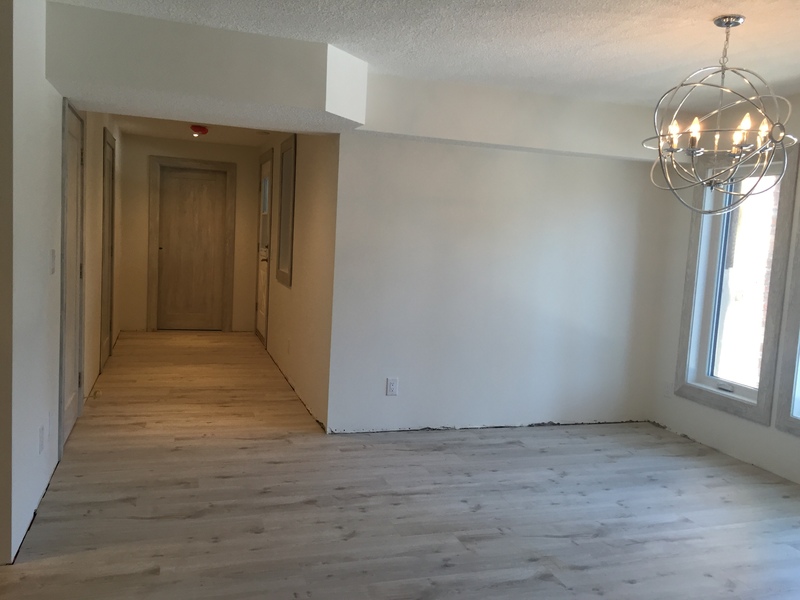 Our painters worked hard to do a complimentary match to the floor finish on the doors and casings. They look great! 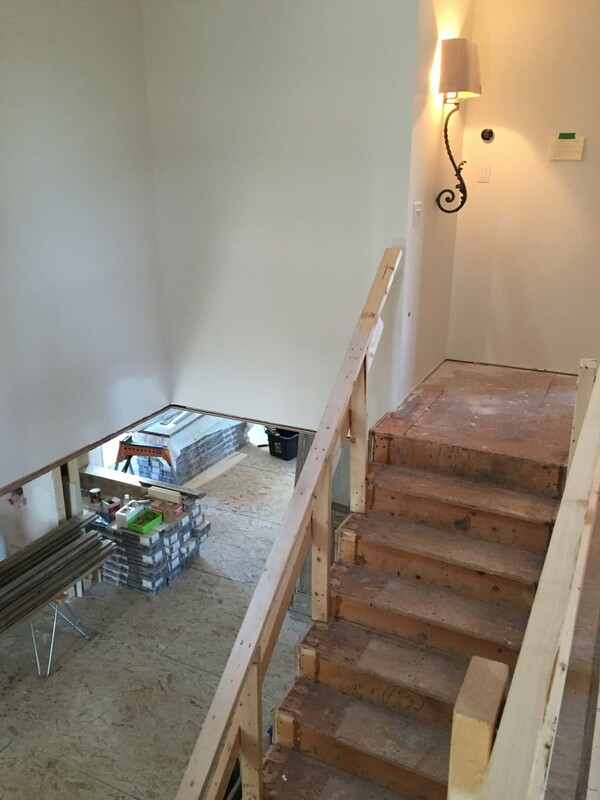 Temporary stairs leading to the upper floor coming out next week to install floating stairs. 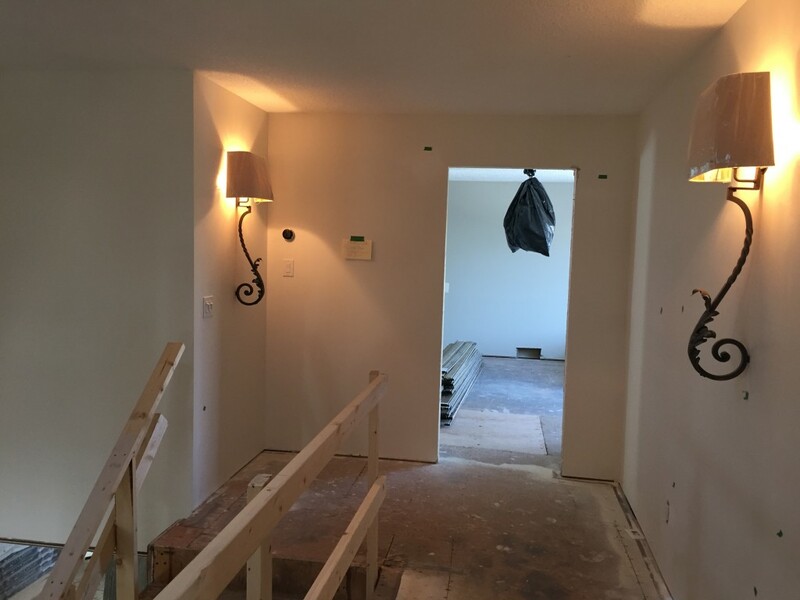 Heading upstairs to the bedroom level. Light sconces from Restoration Hardware. This is a smaller bedroom which has no closet. I have a large antique wardrobe I’m going to place in here, a lovely feminine style table desk with chair and make this room into a linen storage and sewing room. 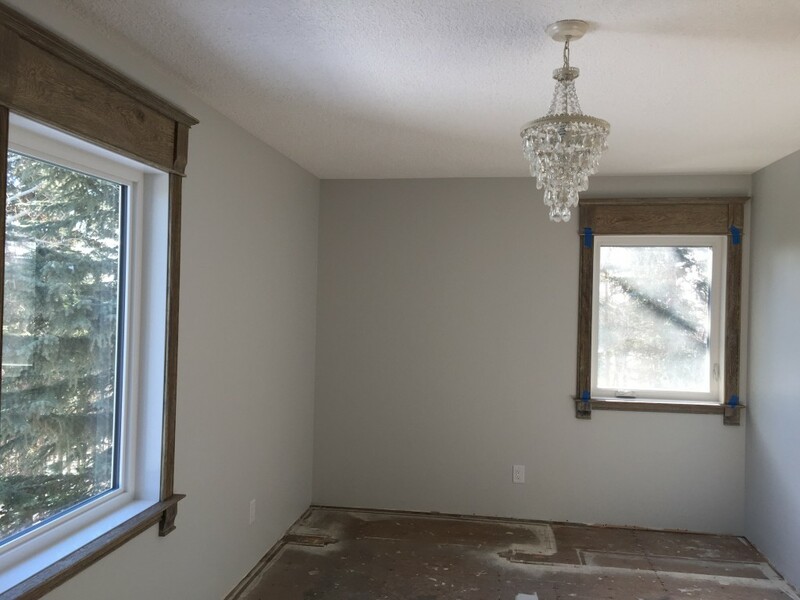 LOVE the light pattern from this chandelier in the grandbabies room! Still in the grandbabies room. Planning on a shoe closet on the left side, a girl’s dream come true! The right closet will have a slide in chest of drawers with upper hanging area. 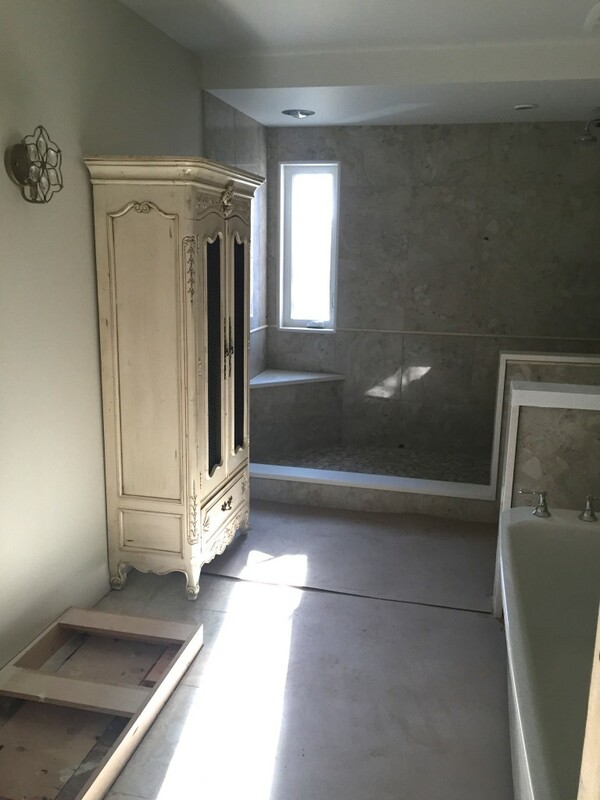 Upstairs guest bath. I put this wardrobe storage piece in to consider whether it will be useful…not sure, it may interfere with the shower entrance…..decision yet to be made. Master bathroom tiling now done. 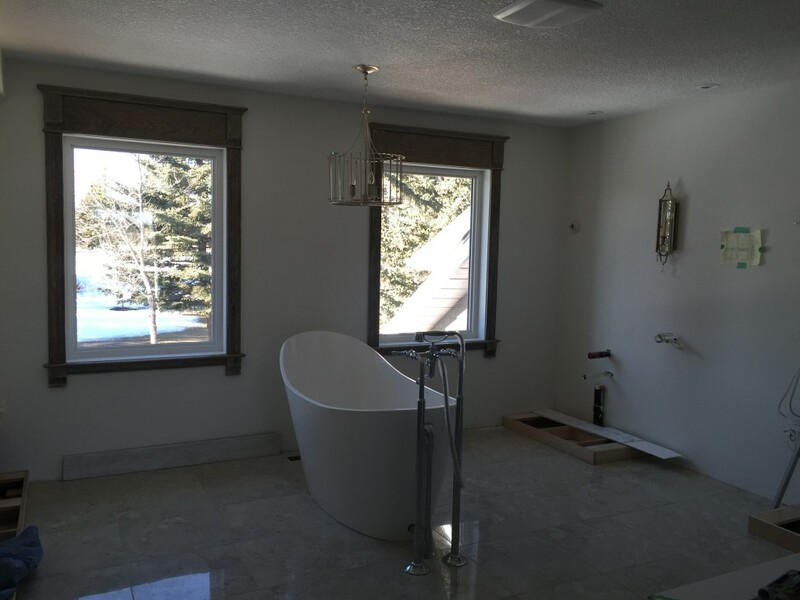 Awaiting vanities, mirrors and additional lighting. 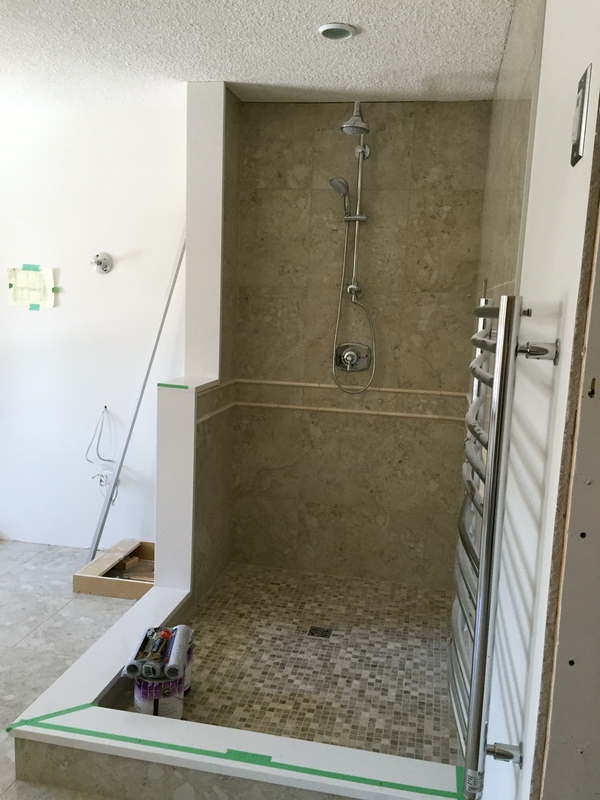 Master bathroom walk in shower is ready for glass. That wraps up this weeks progress and we are so looking forward to finishing up some of the details. 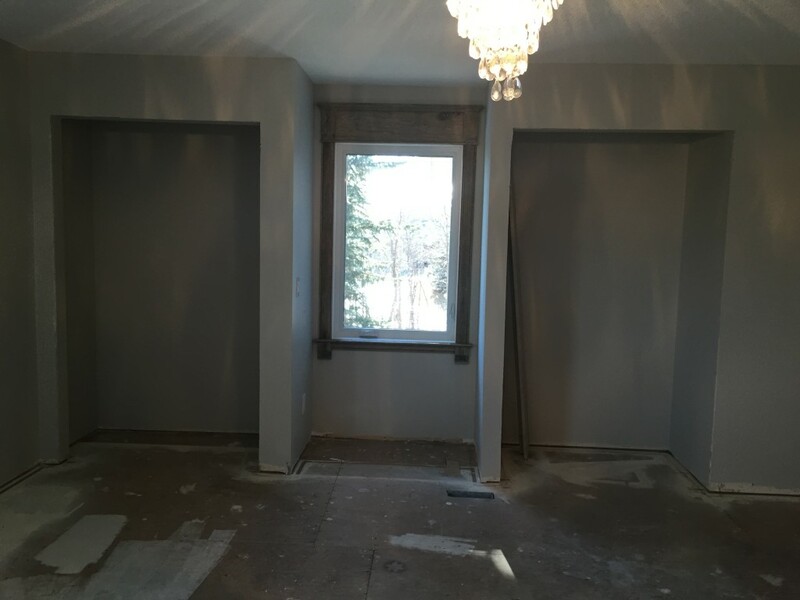 The basement and upper floor is really coming along and once they are done we can section them off and focus on the main level. Still lots to tackle including the kitchen which is as always the hub of a house. I’m so glad we have been able to work with an astounding team that allows us to make decisions along the way. I find (for me anyways) that making decisions and seeing the outcome before moving to the next decision is so helpful. Until next time…god bless!